There are special challenges involved in being autistic and dealing with death. Changes in routine can be very disturbing to a person with Autism Spectrum Disorder, and death changes the lives of everyone involved. In the event that the death is known to be coming in advance, there are many techniques for helping autistic children to deal with the change. The closer the person is to the child, the more preparation is needed, especially in changes in daily schedule. For example, if the terminally ill person usually picks up the child from school, having the person who will be taking over the duties come along for a while can help make that transition as gradual and painless as possible. Creating "memory books" has also proven effective. These are books with pictures of the child and the terminally ill person in familiar environments, as well as pictures of the child alone in those environments. By visually reinforcing this change, the autistic child can internalize the change that is coming. One school went so far as to make a book with pictures of the child and a dead chicken - going through interment, burial, even with a religiously appropriate gravemarker. When the child's father died of cancer, the same process was done with the father's funeral. While this may seem morbid to most people, the process eased the father's absence for the child. It is very important that the death be explained to the child in very clear and precise terms - remember, autistic children tend to take things literally. Saying that a loved one is "sleeping", for example, can lead to the child being terrified when his or her parents might go to sleep. Explaining that bodies wear out and stop working might be a better strategy. Also, letting the child know that they will not see the deceased in the future - except through photographs and videos - is another important fact to be honest about. 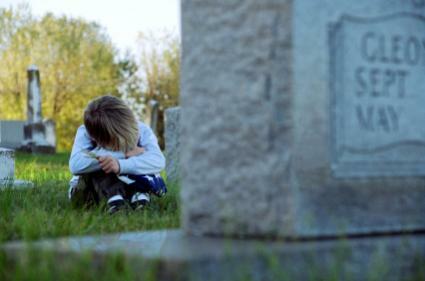 Not all deaths are expected, and part of the trauma for an autistic child will be not only the loss of a loved one but also the changed behavior of those around them who are also dealing with grief. Often the child will react by focusing even more than usual on familiar routines or obsessive behavior. In essence, they are trying to find a safe, familiar place, and they need their support network of family and teachers to help with that. At the same time, because people with autism of any age deal with emotions and abstractions differently than those without, some behaviors may seem callous or uncaring. It's important that the families and friends realize this is actually simply a different coping mechanism, and should be respected. Additionally, the reaction may be delayed weeks or even months - where little or no reaction may be seen initially, it may suddenly manifest in strange ways (for example, linking the deceased to some unconnected event). This is simply the way the autistic child is processing and learning to live with the change. As with the treatment of any other aspect of ASD, being autistic and dealing with death requires the cooperation and attention of the child's entire support network. If the death is impending due to illness, making sure that the child's therapists and teachers know about it can help them prepare for changes in behavior. They can also be a part of the preparation, as in the school that created the "memory book" for the autistic child. Another great resource is to use networks such as Autism Speaks to connect with other families who have had to deal with this circumstance. As more and more research and knowledge is shared in regards to autism and death, the traumatic experience can at least be dealt with using a positive and therapeutic approach.